Systematic Islamist indoctrination in Turkey is becoming less stealthy. Education is the new battlefield. Turkey's government is pushing to advance its declared policy goal of "raising devout (Muslim) generations." In their overall performance, Turkish pupils ranked poorly: 44th out of 65 countries. Ironically, Turkey and six other predominantly Muslim member nations of the OECD all ranked in the bottom slice of the ranking: the United Arab Emirates, 48th; Malaysia, 52nd; Tunisia, 60th; Jordan 61st; Qatar, 63rd; and Indonesia, 64th. Such alarming data did not prompt Turkish leaders to reform the education system. For them, education simply meant ideological indoctrination. Turkish universities did not perform any better. The acclaimed Quacquarelli Symonds [QS], a higher education surveyor, ranked only three Turkish universities in the world's top 500 universities list. According to the findings of QS, only nine Turkish universities (out of 175 Turkish universities) were listed among the world's 800 best universities -- and the best ones appear in the modest 430-460 bracket. When scientific research told them that there was something seriously wrong with education in Turkey, the government amended laws and regulations to allow the Islamic headscarf on campus; then paved the way for fifth-grade students to attend the religious "imam" schools. In 2001, Turkey had 71,000 students enrolled in the imam schools. Now, there are 670,000. It even surfaced at the beginning of the semester in September that the Education Ministry had enrolled a few Jewish and Christian students at imam schools. A ministry official later said that this was a "technical error." If newspapers had not unveiled the scandal, Turkey would be the world's first country to have Jewish and Christian imam students. Last year, the Turkish government made it compulsory for students at fourth grade and higher to take up "religion" classes. In religion classes, the Turkish curriculum almost exclusively teaches the virtues of Sunni Islam, but Alevi or non-Muslim students also must attend these classes. After an appeal by an Alevi family, the European Court of Human Rights [ECHR] recently concluded that the Turkish education system was "still inadequately equipped to ensure respect for parents' convictions" and violated the "right to education." Europe's top court ruled: "Turkey has to remedy the situation without delay, in particular by introducing a system whereby pupils could be exempted from religion and ethics classes without their parents having to disclose their own religious or philosophical convictions." Such was the general set-up when Turkey's National Education Council met last week to debate a better education system and make recommendations to the government. At the meeting, the Council's members did not discuss Turkey's extremely poor PISA rankings. Nor did they discuss improving the curriculum in mathematics and science. Instead, a pro-government teachers' union proposed making religion a required course at preschool. 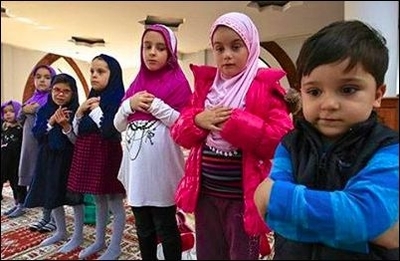 The union demanded that Turkish children aged three to six should be taught Islam. Fortunately, that proposal did not win a go-ahead from the Council but religion (read: Sunni Islam) classes were made compulsory for first, second and third grade students (aged six to eight). Turkey's response to the ECHR, which vehemently told Ankara to scrap all compulsory religious education, was to introduce Islamic teachings to six-year-olds. The Council agreed to recommend that the government scrap "alcoholic beverages service and cocktail preparation" courses at the vocational tourism management schools. The Council ruled that young students should not get acquainted, even for schooling purposes, with alcohol. A new generation of professional Turkish bartenders at five-star hotels will emerge and offer their customers nice non-alcoholic cocktails. Another casualty was the "human rights and democracy" classes that Turkish fourth-grade students must take. That is not a useful subject, the Council members apparently think. A controversial recommendation was to make Ottoman Turkish a required course at all Turkish schools. After hot debate, the Council recommended to make the Ottoman language a required course at imam schools and an elective course at other schools. Ataturk, founder of modern Turkey, abolished the Ottoman language and script in 1928 because only a few Turks, apart from the Ottoman royals and bureaucrats, could speak, read or write that language, a bizarre blend of Turkish with Arabic and Persian. Eighty-six years later, neo-Ottoman Turks wish to revive it in a futile bid: No one knows how many Turks can today speak and teach Ottoman Turkish; but everyone knows there are not more than a few. This is Turkey's return from modern schooling to the times of Ottoman madrassa.